One of the greatest graphic artists of all time, Kollwitz, the granddaughter of a radical preacher and the daughter of a union organizer, a pacifist, a lover of children, and a socialist, spent her life in an autocratic state which, whether ruled by the Kaiser or the Nazis, hated everything for which she stood. The first woman to be elected professor at the Prussian Academy, she lost her position as soon as Hitler came to power. The two prints immediately belowDer Agitationsredner / The Agitator (Kl. 224) and Verbrüderung / Fraternal love (Kl. 199b)seem to sum up the possibilities that Kollwitz foresaw for her country in the 1920s, either to follow those voices inciting hatred and setting each against the other or to find away for all to live together in loving harmony. Kollwitz's art shows us one who responded to her country's choice with anguished protest, as if this print might finally be the one to bring Germany back to her senses. Early in The Long Kiss Goodnight, the lead character, an amnesiac schoolteacher who is beginning to recover her lost memory as a counter-terrorist employed by a secret agency of the US Government, tells her daughter, who has just broken her wrist trying to ice scate, "Life is pain. You just get used to it," advice that returns to save her when, near the end of the movie, after she has been beaten, stabbed, and shot, she tells her daughter to run to escape the bomb that is about to go off and collapses. Her daughter, discovering that her mother is not following her, returns, shakes her, and repeats her mother's words earlier in the movie, forcing her back to consciousness and to join her in escaping from proximity to the bomb, thus enabling the relatively happy ending of the movie. That advice could have come from looking at many of Kathe Kollwitz' portraits of women: for the women depicted in Kollwitz' art, life is indeed frequently hard and full of pain, but the women constantly struggle not to give in to despair, to learn to accept sickenss and death as inevitable parts of life and to try to continue to love those they have as well as those they have lost. I think that Kollwitz would have acknowledged the truths enunciated in William Faulkner's Nobel Prize acceptance speech: "I feel that this award was not made to me as a man, but to my work -- life's work in the agony and sweat of the human spirit, not for glory and least of all for profit, but to create out of the materials of the human spirit something which did not exist before. . . . Man will not merely endure; he will prevail. He is immortal, not because he alone among creatures has an inexhaustible voice, but because he has a soul, a spirit capable of compassion and sacrifice and endurance. The poet's, the writer's, duty is to write about these things. It is his privilege to help man endure by lifting his heart, by reminding him of the courage and honor and hope and pride and compassion and pity and sacrifice which have been the glory of his past." 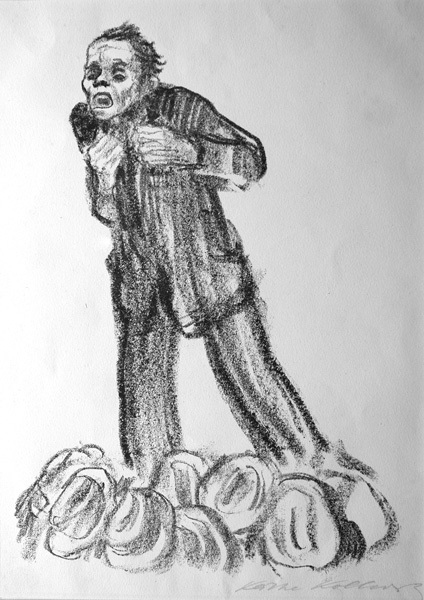 I think that Kollwitz would add her own profession to the list Faulkner provides and say that it is also the artist's duty and, in particular, her duty, to draw the image of that "spirit capable of compassion and sacrifice and endurance." Selected bibliography: Herbert Bittner, Kaethe Kollwitz: Drawings (NY: Yoseloff, 1959), Tom Fecht, ed., Käthe Kollwitz: Works in Color (NY: Schocken Books, 1988), Martha Kearns, Kathe Kollwitz: Woman and Artist (Old Westbury CN: Feminist Press, 1976), Mina C. Klein & H Arthur Kathe Kollwitz: Life in Art (NY: Schocken Books, 1975), August Klipstein, The Graphic Work of Käthe Kollwitz: Complete Illustrated Catalogue (NY: Galerie St. Etienne, 1955), Hans Kollwitz, Ich sah die Welt mit liebevollen Blicken: Kathe Kollwitz: Ein Leben in Selbstzeugnissen, ed. Hans Kollwitz (Hannover: Schmidt-Kuster GMBH, 1968), Hans Kollwitz, ed. The Diary and Letters of Kaethe Kollwitz, trans. 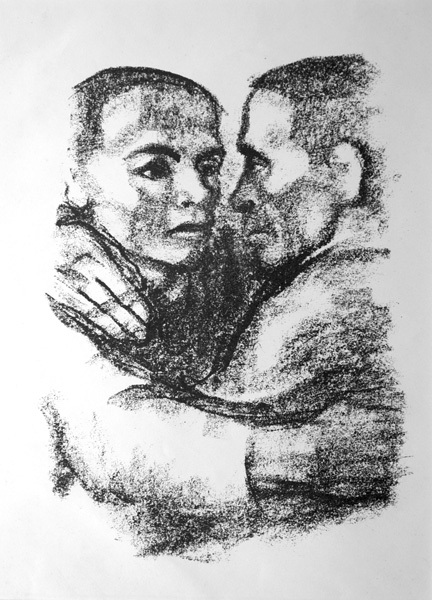 Richard and Clara Winston (Evanston: Northwestern University Press, 1988), Kathe Kollwitz, Das Neue Kollwitz Werk (Dresden: Carl Reissner, 1933), Kathe Kollwitz, Die Graphische Kunst von Kathe Kollwitz (Berlin: A v Der Becke, 1932), Kathe Kollwitz, Käthe Kollwitz Mappe (München: Georg D W Callwey, n d), Malcolm E. Lein, Kaethe Kollwitz (St. Paul: Minnesota Museum of Art, 1973), Otto Nagel, Die Selbstbildnisse der Kathe Kollwitz (Berlin: Henscelverlag, 1965), Otto Nagel, Käthe Kollwitz (Greenwich: New York Graphic Society, 1971); Otto Nagel, The Drawings of Käthe Kollwitz (NY: Crown Publishers, Inc , 1972), Fritz Schmalenbach, Kathe Kollwitz (Konigstein im Taunus: Die Blauen Bucher, 1986), Elizabeth Prelinger, Käthe Kollwitz (Washington, D C : National Gallery of Art, 1992), Carl Zigrosser, Prints and Drawings of Käthe Kollwitz (NY: Dover, 1969). Dehne, Leipzig, 1924). The book was published in a one-time numbered edition totaling 1,400 copies, with 700 copies in German and 700 copies in English. Of those, there was a deluxe edition that contained 400 pencil-signed impressions. Ours is a very strong and fresh impression on paper measuring c. 330x250mm (as called for). There were also some impressions, most signed, printed by von der Becke c. 1931. A powerful image of the possibility of humanity's search for love as a relief from pain and oppression. Included in German Expressionist Prints & Drawings, 1989 (LACMA, p. 52). Images size: 235x170mm. Price: $6250. Verbrüderung / Fraternal love (Kl. 199b). Original lithograph, 1924. Edition: 400 signed impressions and 1000 unsigned impressions, of which this is one. A good impression of this powerful image of the possibility of humanity's search for love as a relief from pain and oppression. Included in German Expressionist Prints & Drawings, 1989 (LACMA, p. 52). Images size: 235x170mm. Price: $2250. Der Agitationsredner / The Agitator (Kl. 224). Original lithograph, 1926. Edition: 25 signed impressions on Japan, 50 signed impressions on white Bütten, and an unsigned edition. Ours is one of the 50 on white Bütten. A powerful and painful study of the politics of the 1920s. Image size: 314x216mm. Price: $6000. Self Portrait (Kl. 122 vii b). Original soft-ground etching and aquatint, 1912. Published in Johannes Sievers' 1913 Catalogue Raisonné of her etchings and lithographs. Ours is a signed impression. Klipstein lists only 30 signed impressions printed by Richter published in 1920, but Richter was also involved in the 1913 catalogue according to its title page. A beautiful rare signed impression. Image size: 140x99mm. Price: SOLD. We also have a very good impression printed in black ink before the von der Becke edition with light matburn away from the platemark (click here). Price: $1750. Self Portrait (Kl. 155 vi b). Original etching with aquatint, 1921. 120 signed and numbered impressions on off-white Butten paper with full margins (complete paper size not shown). A very rich impression of this important self-portrait with very good plate tone. Printed in black ink. 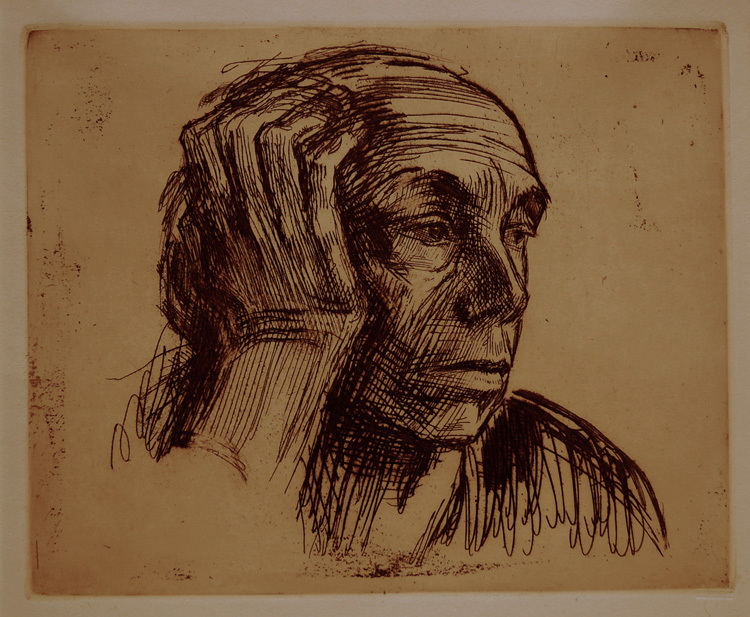 One of Kollwitz' greatest self portraits, another impression of this print was acquired by the National Museum of Women in the Arts several years ago. Signed impressions of this work are almost impossible to find. Provenance: Galerie St. Etienne, NYC. Image size: 217x266mm. Price: SOLD. We also have a good unsigned impression with plate tone published by Münchner Verlag in 1947. Printed in bistre ink. Price: SOLD. Self Portrait (Kl. 155 vii/vii, von Knesebeck 171 vi: d). Original etching with aquatint, 1921. Published after 1947 by von der Becke with his two-line Muenchen22 drystamp lower right. A very rich impression of this important self-portrait with very good plate tone. Printed in dark bistre ink. 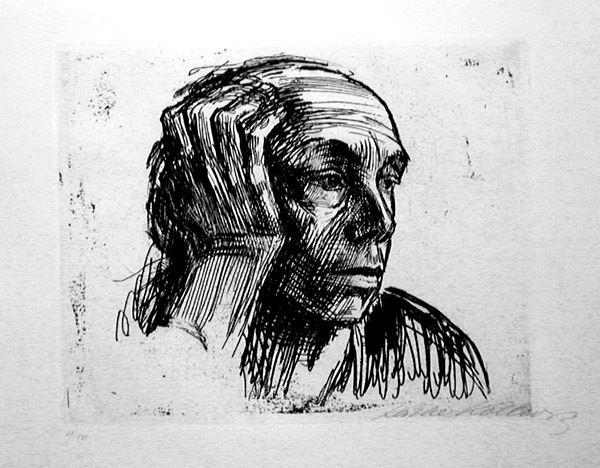 One of Kollwitz' greatest self-portraits, another impression of this print was acquired by the National Museum of Women in the Arts several years ago. Image size: 217x266mm. Price: $3750. Deutschlands kinder hungern!/ Germany's children are starving! (Kl. 190 A.III.a.1). Original lithograph, 1924. One of Kollwitz' most frequently illustrated works, this was first published as a poster then without text as here. Published by Richter with his blind stamp lower right. 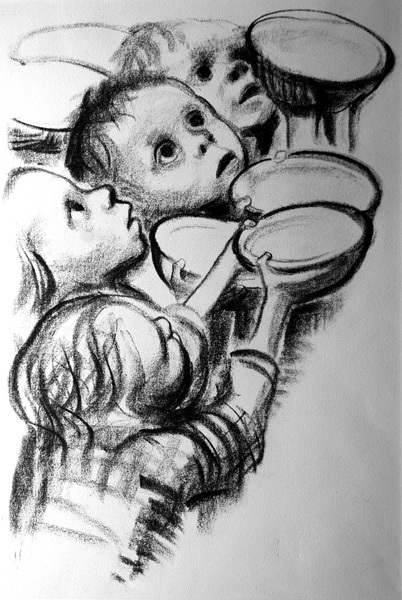 One of Kollwitz' most important works. Image size: 405x275mm. Price: $3625. Szene aus Germinal / Scene from Germinal (Kl. 21 iv/iv, Knesebeck 19 IV/IV). Original etching, drypoint, and sandpaper, c. 1892-1893. 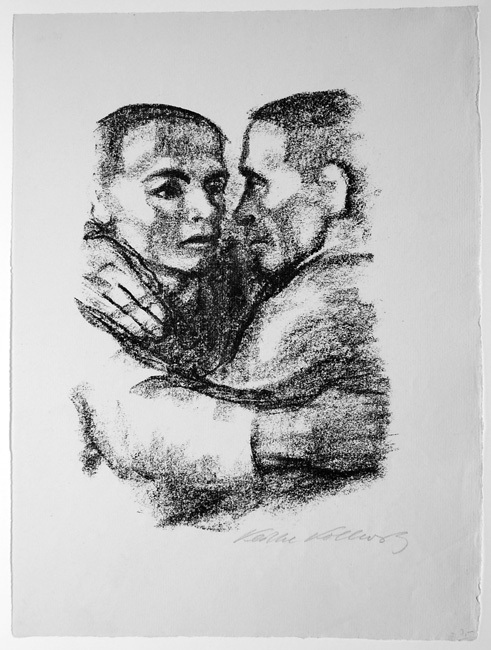 Kollwitz was working on a series of prints based upon Zola's novel, Germinal, which deals with the hard fate of the working classes, when, after attending the premiere of Hauptmann's play on the Weavers' Revolt on 26 February 1893, she decided to do her series on the Weavers' Revolt instead. This piece represents the fight between Etienne and Chaval over Catherine and her horrified response to their struggle. There are some proofs printed by Felsing before the Seemann edition of 1917 (from which our impression comes) with the addition of the engraved script upper right giving the address of the printer ("L. Angerer, Berlin impr.") 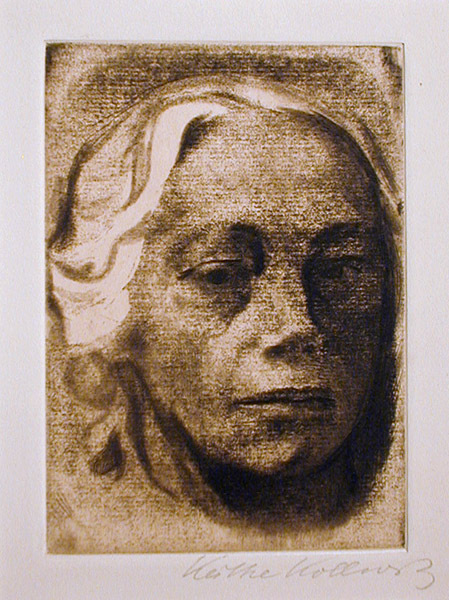 and "Käthe Kollwitz rad." bottom left and "Verlag E. A. Seemann, Leipzig" bottom right. This edition was unsigned, with occasional impressions with complimentary signatures. There are no later reprints. An uncommon print. Image size: 239x528mm. Price: $3600.